A good night last night as we went 2-1. We had over 5 in the Rangers vs Caps game and the Caps got back in the win column when they won 5-2. Ovechkin scored to bring his goal total to 27 which has him 2nd overall in the league. Justin Williams scored a hat trick. Had over 5 in the Panthers vs Lightning game but this one stayed low when the Lightning won 3-1. 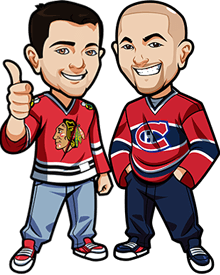 Our last tip of the night was the Blackhawks in regulation against the Canadiens and they won 5-2. The Hawks tied a franchise record with their 11th straight win. The Pens came away with the 5-0 win and Crosby scored twice in the game. The Kings beat the Ducks 3-2. Perron scored in his debut with the Ducks and Lecavalier scored which is his 5th point since joining the Kings. The Avalanche are having problems scoring goals right now. They have only scored 7 goals in their last 4 games. They have beat the Jets twice so far this season. The Jets are on a 2 game win streak and have gotten some solid goaltending from Hellebuyck.